This photo was taken standing on the road, it would be near enough what motorist would see before they cross Scanlan Street and proceed along Crummer Road, (travelling on the other side if the road, against the arrow). ** Motorist around Auckland need to learn the road code they seem to think "stop" signs are in fact "give way" signs one day I did in fact see a motorist stop at a "stop" sign only because there was a car coming down the other way. ** also motorist do not know the difference between the give way triangle and the pedestrian diamond painted on the roads, all the time I see pedestrian think there is a pedestrian crossing on Domain Drive at the park road intersection BECAUSE THAT PART OF THE ROAD IS RAISED, one day I heard a motorist toot at a pedestrian because the pedestrian walked out in front of them. 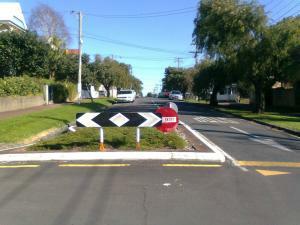 Auckland City council workers need to learn what "safety" means. I wrote a letter to ACC just after this road was raised.